Tablet Kiosk Desk Mounted Stand & Locking System - Great for point-of-sale, hotels, restaurants and many other applications. Swivels to maneuver tablet between vendor and customer. Sturdy design can be used in heavy use environments. Can be mounted by desk clamp or grommet mount, included. Optional Security Locking System (TS905) secures tablet. Universal design fits most 7""-10"" tablets, including Apple iPad? (all generations), Samsung Galaxy Tab, Microsoft Surface, Kindle Fire and more. 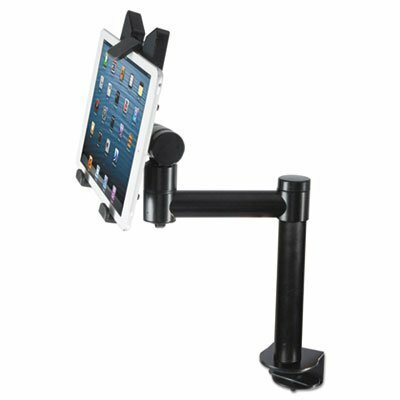 For Use With: Tablets; Accessory Type: Stand; Material(s): Aluminum; Color(s): Black. Holder attaches to desk and can be maneuvered for point-of-sale use. Great for point-of-sale, hotels, restaurants and many other applications. Swivels to maneuver tablet between vendor and customer. Sturdy design can be used in heavy use environments. Can be mounted by desk clamp or grommet mount (included). If you have any questions about this product by Kantek, contact us by completing and submitting the form below. If you are looking for a specif part number, please include it with your message. Elitech Sit and Stand Desk Converter with retractable keyboard tray – 37" inches height adjustable standing desk converter that serve as a desk riser for dual monitor set up and tablet. © 2019 - thegmailsignin.com. All Rights Reserved.